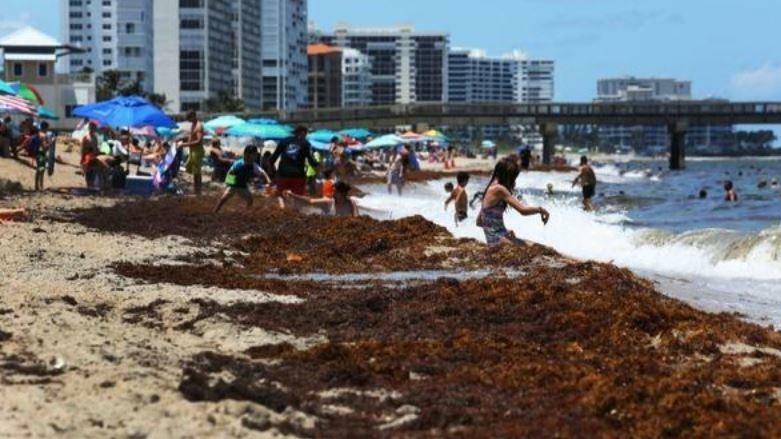 Florida Tourism is under threat because beaches are under threat, and the cause is seaweed. Fort Lauderdale asked the State of Florida, which regulates how cities clean their eaches, if they can use heavier equipment. City crews work for hours every morning with large machines to chop up the seaweed and bury it — or use dump trucks to haul it away, so beaches become presentable to tourists – and it smells. They clear thick mats of brown, squishy stuff that smells like rotten eggs, so beachgoers can enjoy seaweed-free beaches. It has been an especially difficult battle lately with a dramatic increase in seaweed floating to South Florida and the Caribbean. The level of seaweed was eight times greater than last month. — Pollutants from rivers or dust blown from the Sahara into the ocean, which act as nutrients for algae like seaweed. — Changes in the ocean current. — Warmer sea water temperatures. Broward County, with Nova Southeastern University, runs a program to mark the nests on the beaches every morning before cleaning crews drive their equipment on the sand. Crews must start after the mapping ends but before beachgoers arrive. Hollywood crews remove trash from the seaweed before using two tractor machines with blades to mix the seaweed with the sand and bury it at the high tide line. Fort Lauderdale is the only other Broward city that hauls away the seaweed. On heavy days, the city’s crews load more than 70 cubic yards in at least eight dump trucks to cart off to a facility where they clean off the salt water and compost it into soil. Like Hollywood, most other Broward cities, including Dania Beach and Pompano Beach, chop up the seaweed and bury it at the high-tide line. The seaweed, although natural and not harmful, is increasing in its abundance. That makes cleanup more crucial to give beachgoers a pleasant, stink-free experience.